Education: Kaitlin received her bachelor’s degree in health sciences 2009 and completed her Doctorate of Physical Therapy both from University of the Sciences in Philadelphia PA in 2011. She has been working at PMC since May 2013. Clinical interests: She enjoys working with orthopedic patients and balance/ coordination deficits. Fun Fact: Kaitlin lived in 4 states in 2 years. Education: Ellie received her Bachelor’s in cell biology and neuroscience from Montana State University in 2009 and completed her Doctorate of Physical Therapy from the University of Kansas Medical Center in 2012. 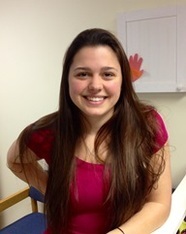 Ellie joined PMC in June 2012. Clinical Interests: She enjoys working with patients recovering from sports injury, and working with the vestibular system. She also has a specific clinical interest in working in women’s health. Ellie has taken continuing education focusing on knee pain, lumbopelvic pain and women’s health. Fun Fact: Ellie placed 9th in the Women’s pole vault in the 2008 Olympic trials. Doctorate degree in Physical Therapy in 2013, both from Quinnipiac University. Bradee joined PMC in February 2014. Clinical interests: Her clinical interests include working in the outpatient setting. She has a specific interest in working with the pediatric population varying from infants with developmental delay all the way to high school athletes recovering from sports injury. She will be taking her first class in neuro-developmental technique in summer 2014. Fun Fact: Bradee completed her first marathon in October 2013. Education: Bailey received her bachelor’s degree in communication sciences and disorders from Illinois State University in 2014 and her Master’s in speech-language pathology from Appalachian State University in 2017. She has been working at PMC since November of 2017. Clinical interests: Her clinical interests include dysphagia and cognition. She enjoys working with patients of all ages. Fun Fact: Bailey has visited 6 countries within the past 4 years. Education: Marina completed her bachelor’s degree in Exercise and Sport Science in 2015 and my Doctorate of Physical Therapy in 2018 both from Saint Catherine University in Minnesota. She has been working at PMC since August 2018. Clinical Interests: Her clinical interest are working with patients of all ages and across all settings. She is especially interested in falls prevention in older adults. Fun Facts: Marina loves Harry Potter, my dogs, her husband, Katy Perry and playing the piano. Education: Tara received her BA in sociology from the University of Colorado, Colorado Springs. Her graduate degree is a MSOT from Virginia Commonwealth University. She began working at PMC February 2018. Clinical Interests: Tara loves working with patient’s from across the life span. She has specialties in dementia care with an interest in helping others care for their loved ones. Her interests include therapeutic use of animals in treatment and working with self-regulation and sensory modulation with kids.